For other uses, see Light Cavalry (disambiguation). French 4th Hussar at the Battle of Friedland, 14 June 1807. "Vive l'Empereur!" by Édouard Detaille, 1891. Light cavalry comprises lightly armed and lightly armoured troops mounted on horses, as opposed to heavy cavalry, where the riders (and sometimes the horses) are heavily armored. The missions of the light cavalry were primarily reconnaissance, screening, skirmishing, raiding, and most importantly, communications, and were usually armed with spears, swords, bows and later with pistols and carbines. Light cavalry was used infrequently by the Greeks and Romans (though Roman auxiliaries were often mounted), but were popular among the armies of Central Asia and Southwest Asia. The Arabs, Hungarians, Huns, Mongols, Turks, Parthians, and Persians were all adept light cavalrymen and horse archers. With the decline of feudalism and knighthood in Europe, light cavalry became more prominent in the armies of the continent. Many were equipped with firearms, as their predecessors had been with bows. European examples of light cavalry included stradiots, hobelars, hussars, chasseurs à cheval, cossacks, chevau-légers, uhlans and some dragoons. Armies of the ancient Roman-Germanic wars made use of light cavalry as patrolling squads, or armed scouts, and often had them in the front lines during regional battles. During the Punic Wars, one of Carthage's main advantages over Roman armies was its extensive use of Numidian light cavalry. Partly because of this, the Roman general Scipio Africanus recruited his own cavalry from Sicily before his invasion of Tunisia during the Second Punic War. A variety of types of light cavalry were developed in medieval armies. Koursores: Byzantine light cavalry. The name derives from the Latin term cursarius meaning 'raider'. Horse archers armed with composite bows allowed the Mongols to conquer large parts of Asia and Europe in the 13th century. Horse archers were also used extensively in steppe warfare throughout Central Asia and the American prairies. Light cavalry played a key role in mounted scouting, escorting and skirmishing during the Napoleonic era. Light horse also served a function in major set-piece battles. While lacking the sheer offensive power of heavy cavalry, light cavalry were still extremely effective against unprepared infantry and artillery. All infantry commanders were forced to respect the danger any cavalry presented to their forces, and light cavalry were effective at changing the movement of enemy forces simply through their presence. In the aftermath of battles, light cavalry were used to press a victors advantage or to screen retreating forces from further attack. Hussars: distinctively dressed light cavalry of Hungarian origin. 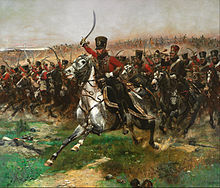 Locally recruited Hussar regiments were incorporated in most Napoleonic armies although by this period their functions and equipment were the same as other categories of light horse. Uhlans: originally Polish light cavalry armed with lances as their primary weapon (plus sabers and pistols). Locally recruited lancer regiments with this designation were later also used by the Russian, Prussian and Austrian armies. The long reach of the lance made them an effective shock force against dispersed infantry. Dragoons: Originally a type of mounted infantry armed with muskets, dragoons had by the late eighteenth century evolved into heavy and light dragoon classes. The latter performed the usual functions of light cavalry, although they might on occasion still undertake dismounted action using carbines. Sowars: An Indian horseman armed with a sword or light lance. Light horsemen with this designation had comprised the bulk of Mughul and other Indian cavalry forces during the 18th century. Regiments of sowers designated as Light Cavalry were subsequently widely employed by the British East India Company. Chasseurs à cheval: the main element of the French light cavalry. Performed the same functions as hussars. Cossacks: Russian irregular light horse armed with lances and recruited on a semi-feudal basis from frontier communities. Required to provide their own horses and equipment and meet long-term service obligations in return for land grants. Played a major role in harassing French and allied armies during the Retreat from Moscow of 1812. As late as the early 1900s most European armies still retained a nominal division of mounted troops according to the size and weight of the men, into light cavalry (reconnaissance, scouting and screening), medium cavalry (attack and defense of specific locations) and heavy cavalry (shock action on the battlefield). While colonial warfare had led to a blurring of these distinctions in the British army, tradition remained strong in the cavalry arm of some other nations. As an example, the Imperial German army maintained a marked difference between the sizes and weights of the men and horses allocated to the hussar regiments that made up its light cavalry and those of the other two categories. The early weeks of World War I saw light cavalry attempting to continue its long established function of being the "eyes and ears" of the respective main armies. However, despite some early success, the advent of trench warfare and aircraft observation quickly rendered this role obsolete, except to an extent in the Middle East in 1917, and in Eastern Europe where light cavalry mounted actions on a diminishing scale continued to occur until the revolution of 1917 took Russia out of the war. ^ Bryan Fosten (1982). Wellington's Light Cavalry. Osprey Publishing. ISBN 0-85045-449-2. ^ Brzezinski, Vukšić, Richard, Velimir (25 July 2006). Polish Winged Hussar 1576–1775. Osprey Publishing. ISBN 1-84176-650-X. ^ Von Koppen, Fedor. The Armies of Europe Illustrated. p. 5. ISBN 978-1-78331-175-0. ^ Littauer, Vladimir. Russian Hussar. pp. 3–5. ISBN 1-59048-256-5. This page was last edited on 20 February 2019, at 12:19 (UTC).